【Wifi Wirelss】: Supports high-definition image transmission through the self-developed free APP, and you can take photos and videos easily. 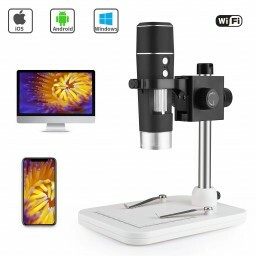 Compatible with both Apple iOS and Android phone.It also works with Windows XP/Vista/Win7/Win8/Win10(Need to download APP,please refer to the user manual). 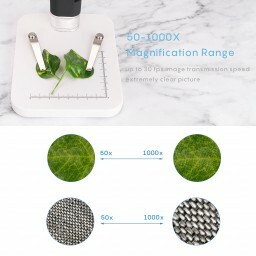 【High 50x-500X Magnification】: The 8 LED bead lights are bright enough for most observation,and the brightness is adjustable easily. 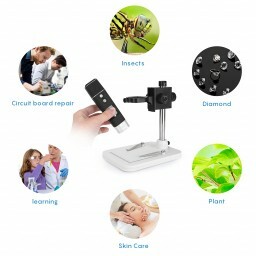 High magnification can be widely used,such as electronic circuit boards manintance,kids education inspection,biological observation,medical use,jewelry inspection,textile industrial,biological inspection and so on. 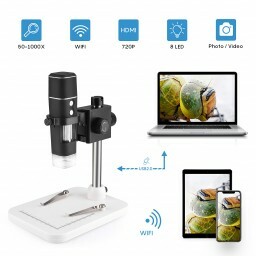 【Taking Photo & Video Available】: Just press the Image/Video button to taking an image or video easily, or pressing related APP trigger.The Wifi handheld digital microscope with HD CMOS sensor image processing technology and store them instantly to your phone.Built-in rechargeable 800mah battery can work for 1.5 hours. You can also connect to the power supply directly.